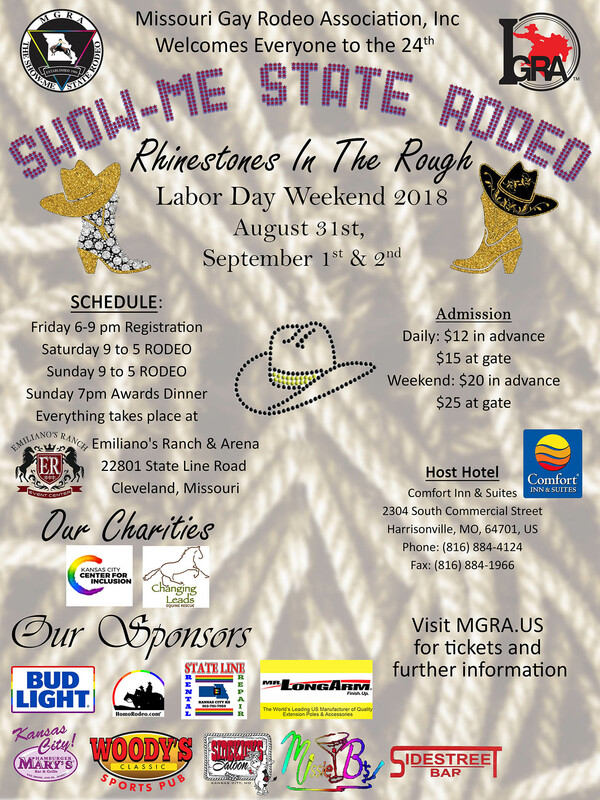 The Missouri Gay Rodeo Association (MGRA) is celebrating 33 years, 1986 - 2019. We are a 501 (c) (3) corporation who produces The Show-Me State Rodeo each year during Labor Day weekend. We are an affiliated chapter of the International Gay Rodeo Association (IGRA) who sanctions the rodeo. We are an all-volunteer organization and any profits we make from the rodeo are given back to our community by donating to our Charity Partners, Changing Leads and KC Center for Inclusion. The MGRA board of directors is working diligently to produce the Show-Me State Rodeo in 2019. We invite all contestants and spectators to join us for a great weekend at Emiliano's Ranch and Arena and the Show-Me State Rodeo. Tickets to watch the rodeo can be puprchased here. Contestants with an assigned IGRA numbers must mail a completed IGRA Event form with a postmark date no less than twenty-two(22) days prior (August 10th) to the rodeo's first performance if not signing up via the online link below. Entry fees are $30 per event/per day. Must enter a minimum of one event each day or two events in one day to compete. Therefore is a minimum non-refundable deposit required of $60 with mail in or on-line preregistrations. All IGRA rules and regulations will be adhered to for the Show-Me State Rodeo. Registration for rodeo weekend will be Friday, Aug 30, 2019 from 6 – 9 PM at the arena. Late registrations will be accepted. Late Fee Policy is in effect. Contestants who register after the preregistration period has expired shall be assessed a late fee of $50. A late fee of $50 shall be assessed to all preregistered contestants adding rough stock events after the preregistration period has expired. This fee applies only to contestants who have been assigned a four (4) digit IGRA contestant number more than thirty (30) days prior to registration date. Payout for the Show-Me State Rodeo shall follow IGRA guidelines. There is a $2,000 Added Prize Money to be divided equally to the first place winners in all events. The New Contestant Meeting will be at 8:30 am, September , 2019 at the Rodeo Arena in the Grand Stands. Rodeo begins at 9:00 am. The one free horse stall only applies for 3 Days (Friday through Monday Morning or Thursday through Sunday) of the rodeo weekend. $25 per day per stall for any days over 3 days. A Vet will be on site for Rodeo Events and a Farrier will be on call. Due to county ordinance, PETS ARE NOT ALLOWED INSIDE THE VIEWING AREA OF THE VENUE. Please be prepared to keep your pets inside your RV or camping area. Pets will not be allowed to run free in any area of the rodeo grounds. Reservations need to be made by by calling the hotel. Group Rate reservations can't be made on line. Hotel is 22 miles (25 - 30 Minutes) to the Emiliano's Ranch (formerly Lone Wolf) Arena. MGRA will be once again hosting a catered awards dinner at the Arena starting at 7:00 pm on Sunday, September 1st for $12/Person. Tickets can be purchased at the rodeo. The awards Ceremony will begin at 8:00 pm.